Excitement is building for the 2013 Epcot Food and Wine Festival! 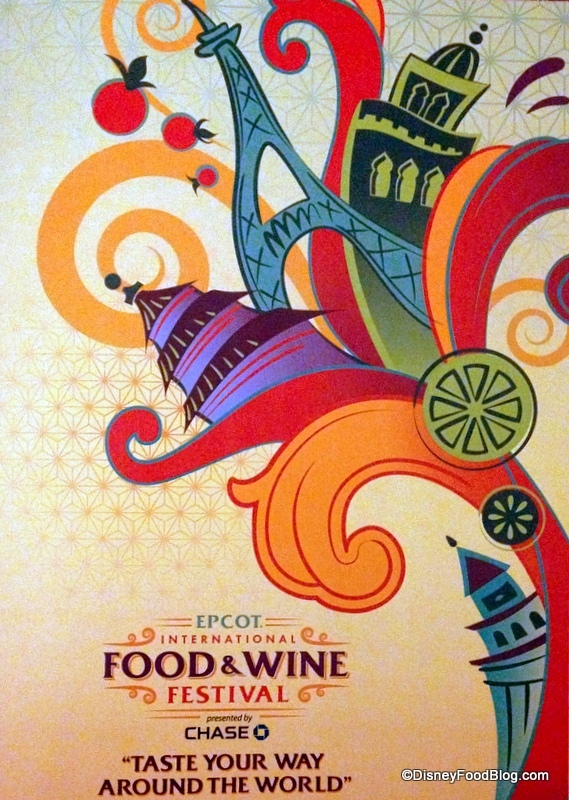 We got our first look at festival artwork at the recent Food and Wine Festival preview, and people are already talking about how much they love it! I adore how they’ve worked World Showcase landmarks into the colorful art. 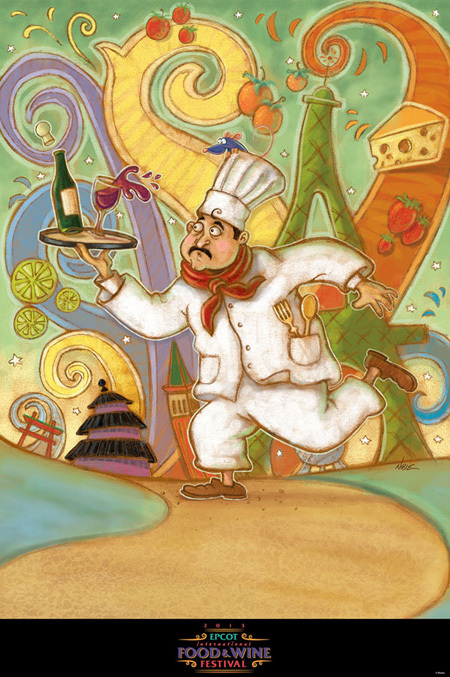 Today, we’re psyched to share with you some of the 2013 Epcot Food and Wine Festival artwork and other merchandise that will be featured during this year’s event! This year’s signature artwork is quite a departure from last year’s more photojournalistic style. In 2013, the mood has turned whimsical, and the familiar motif of this year’s festival decor turns up in the background, but in a softer pastel palette. Look closely, and you’ll even spy Remy from Ratatouille perched in the top of the bumbling chef’s toque! 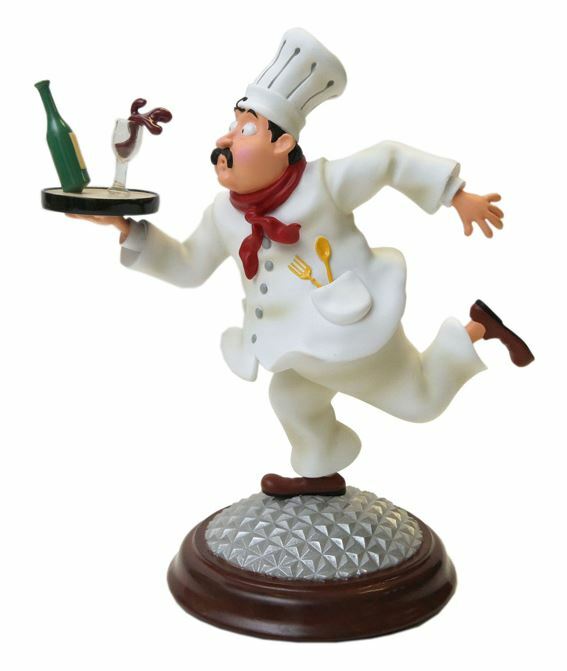 The chef is also the star of a new 7-inch bobble figurine, made extra awesome because he’s balancing on top of Spaceship Earth! Disney artists have also created new character artwork with Mickey, Goofy, and Donald in chef whites. The character pieces are reminiscent of similar vintage-inspired pieces that we’ve spied in the Italy pavilion. We can’t wait to see all the cool ways these three will be featured! 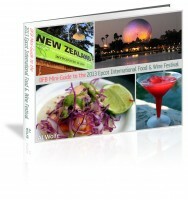 The merchandise team has come up with a great line up of must-haves for the 2013 festival. The bumbling chef turns up on reusable shopping bags, and artwork is featured on the palette plates that we love, love, love. A new set of Mickey ears features a chef’s hat and is sure to be a hit with festival goers. And the pins! I don’t know about you, but I’m pretty sure I have to have the new Cranberry BOG pin, featuring Chip ‘n’ Dale! And Duffy the Disney Bear is sporting some new togs, too. 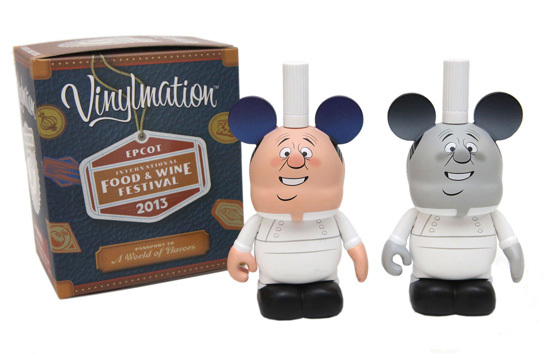 Vinylmation collectors will want to check out the limited edition 2013 Food and Wine Festival Vinylmation, featuring Chef Gusteau from Ratatouille. Only 2,500 of the figures are being produced — 2,250 in the full color version, and only 250 of the black and white guy. Packaged in a mystery box, it will be fun to see which one you get. 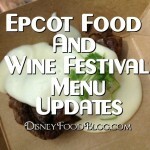 Chef Gusteau From Ratatouille Stars in Food and Wine Festival Vinylmation! 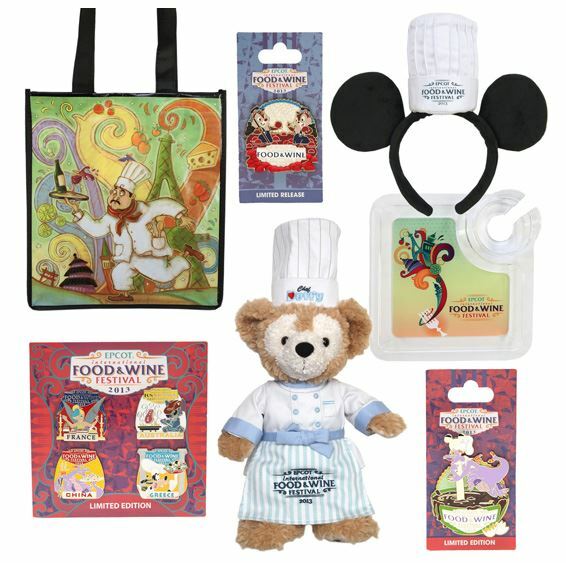 Look for all of the fun Food and Wine Festival-themed merchandise at Festival Center as well as at stands throughout World Showcase. 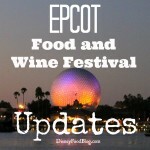 What souvenir will you be bringing home from this year’s Food and Wine Festival? Leave a comment and let us know which is your favorite! News! 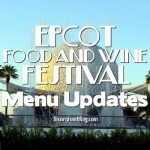 Select 2013 Epcot Food and Wine Festival Menu Items Announced! AJ – Will you be purchasing a tray or bringing your own again? I love the bobble figurine. I like when things are “Disney” but don’t scream Disney. A bit off topic but, is it just me or has Disney not posted the schedule of events for the festival yet? I feel like in past years is was posted much earlier. I would love to know which chefs and what type of food I am paying to have a seminar on before I pay. All the merch looks great! I love the little tray. I’m with LizC…as an annual passholder, I can register for events on Friday but I have no idea what I can register for! I love the festival merchandise options for this year. I see myself purchasing many of these items. Also, I agree with LizC on the festival events schedule. I could of sworn that by this same time last year that this information was available. Any idea when this information will be available? Alicia — I always bring my own! LizC — Disney always releases the seminars and demos about a day or two before they’re able to be booked. I’ve never seen them release those specific events any earlier. Amy — Enjoy your trip to the festival! 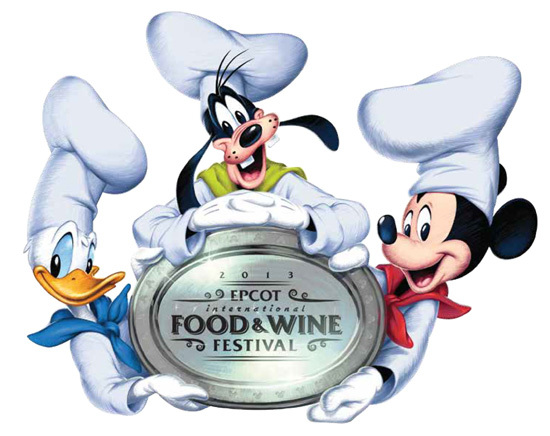 Always looked forward to Food & Wine Festival…..We, girls, cannot wait for Oct..Bringing our 16 yr old niece o her FIRST Festival, she’s looking forward to it too. Is there any way to get the merchandise without being there? I am unable to attend but would really like one of the posters to frame and hang in my dining room. Can you purchase the merchandise before the event? 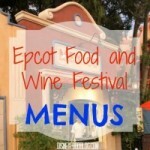 Also is Epcot the only place to purchase the Food and Wine gift cards for your wrist? Can you just buy the Duffy outfit? Or do you have to buy the whole bear to get the outfit? Could someone please tell me – is the size of the festival poster 11″x17″? Rena — Try the merchandise guest services number — 877-560-6477. Chris — I realize we’re late answering this one — sorry about that! –, but no, the merchandise is available only once the festival starts for future reference. I’ve only seen the Epcot F&W gift cards at Epcot. Sarah — The large poster is full size and quite a bit larger than that. It’s 18×24, I believe.